Jonker Certified! Bluetooth! Navigation! Great Condition! This 2015 Brilliant Silver Nissan Altima provides excellent comfort for passengers as well as offers great features to help enjoy the drive. Climb inside the Black leather interior to find Bluetooth and other steering wheel mounted controls perfect for keeping eyes on the road. This Altima also comes equipped with back up camera with dynamic guidelines, fog lights, dual zone climate controls, power heated front seats, cruise control, A/C, keyless entry with remote engine start and push button ignition, moonroof, FM/AM/XM/CD/AUX/USB audio system, alloys, hood deflector, and more! Every certified pre-owned vehicle from Jonker Nissan comes standard with peace of mind. Only select vehicles qualify for the Jonker Certified Program. Each vehicle receives a rigorous set of inspections designed to ensure that your used vehicle is safe and ready for driving on the road. This ensures that your new Jonker Certified vehicle is safe and road-ready! We encourage you to contact our friendly Jonker Sales Team today for all the vehicle information and to set up your test drive. 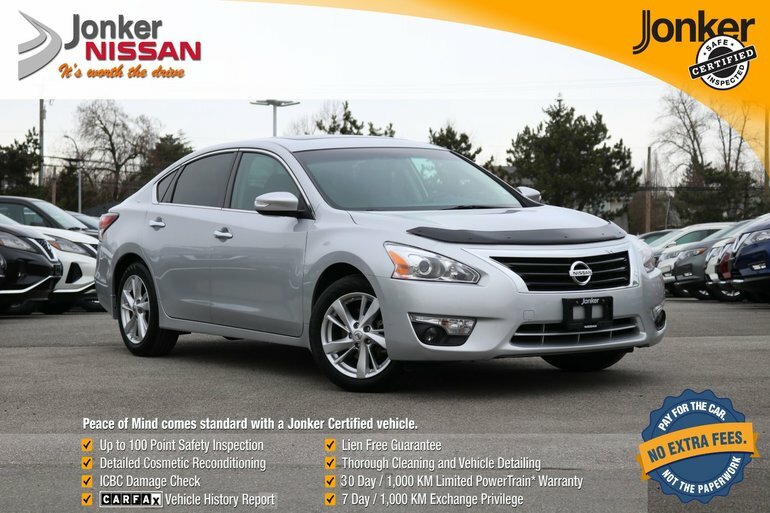 Interested by the 2015 Nissan Altima Sedan 2.5 SL CVT ?